Tech4Learning’s Pixie for iPad wins ComputED Gazette EDDIE Award for Best Educational Software in the category of Multimedia Creation for Early Elementary. Tech4Learning’s Pixie is now available in the Apple App store for the iPad. Millions of students world-wide are using Pixie on their computers, and now they can use Pixie on the iPad to create and share their ideas, imagination and understanding through a combination of text, original artwork, voice narration and images. 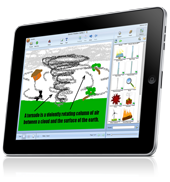 Tech4Learning’s Wixie is now available in the Apple App store for the iPad. The new Wixie app takes advantage of the iPad’s touch interface, while connecting to storage, classroom management, portfolio, and assessment tools in the cloud. San Diego, California, March 14, 2012 — Tech4Learning has released an update to Wixie that allows student projects to be viewed on the iPad. Wixie projects now play back in Flash, HTML 5 or HTML depending on the capabilities of the web browser viewing the project.